Ringing in at over 520 square miles, Canyonlands is the largest of Utah’s five national parks, and doubtless one of the most stunning. Known for its sweeping vistas of colorful desert landscapes carved by rivers into countless canyons, Canyonlands National Park draws thousands of visitors each year both with its views and its endless outdoor recreational opportunities. The park is divided into four distinct areas, each offering a unique perspective on this stark desert ecosystem. Island in the Sky is a flat-topped mesa, while the Needles are tall, sharp spires; the Maze is a seemingly-endless system of crevasses and canyons, and finally, visitors can see where the Colorado and Green rivers intersect at the Colorado Plateau. The park also boasts some original Native American rock paintings inside its iconic Horseshoe Canyon. Like its neighbor Arches to the north, Canyonlands is served by the small, but busy gateway city of Moab, Utah, where visitors can enjoy a variety of restaurants, shopping opportunities, museums, and cultural events. Other small towns in the Canyonlands area include Monticello and Spanish Valley. The weather at Canyonlands is characterized by the wide temperature fluctuations of a high desert environment; the area sometimes sees temperatures change by more than 40 F in one day. The summer is excruciatingly hot and prone to sudden afternoon thunderstorms, while the spring and fall bring temperate climates -- and crowds. With its singular landscape, Canyonlands offers unparallelled outdoor adventure opportunities, both terrestrial and on water. Visitors can enjoy the park on foot, horseback, or bicycle, or take to its two formative rivers for both flat- and whitewater boating. The Park Service also hosts a number of organized, ranger-led activities, such as geological talks and stargazing parties. Check the official park calendar for up-to-date information on these opportunities. 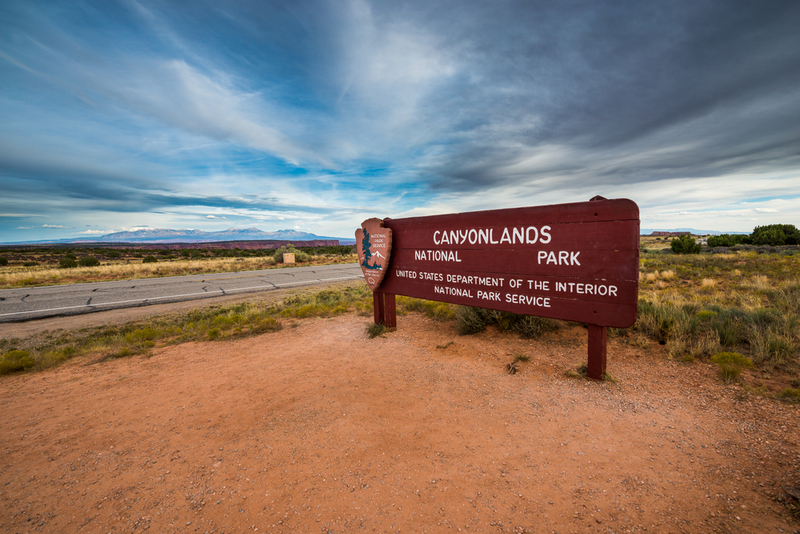 Canyonlands features two on-site campgrounds, which are accessible and open to RV camping. However, neither campground has RV hookups, and both have a tendency to fill up fast. Fortunately, campers can also choose from a wide array of privately-owned RV parks and campgrounds in this popular travel area, as well as a number of free or low-cost dispersed camping or boondocking options. 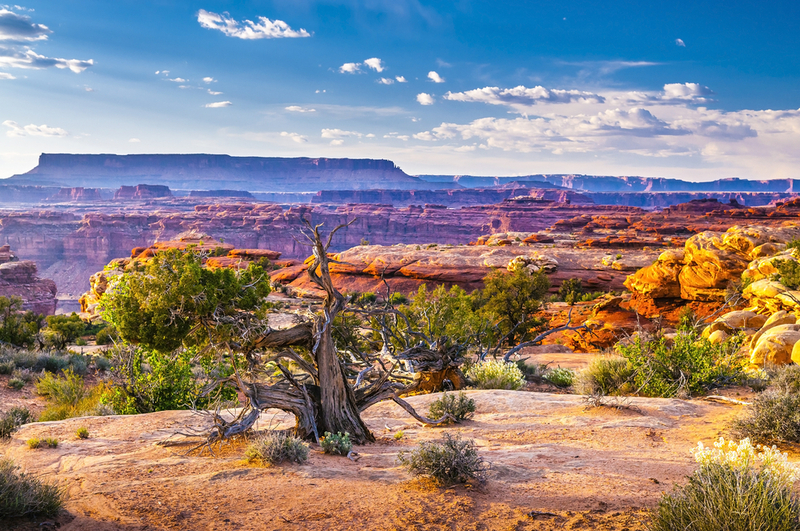 For more information on camping in and around Canyonlands National Park, click here. No matter your fitness level or which part of the park you’re in, you’ll find miles and miles of hiking trails beckoning you to wander. As in any hiking scenario, all members of your group should be outfitted with sturdy shoes, protective clothing, and an ample supply of water. Given Canyonlands’ desert environment, hats and sunglasses are recommended, as is sunscreen and an early start. 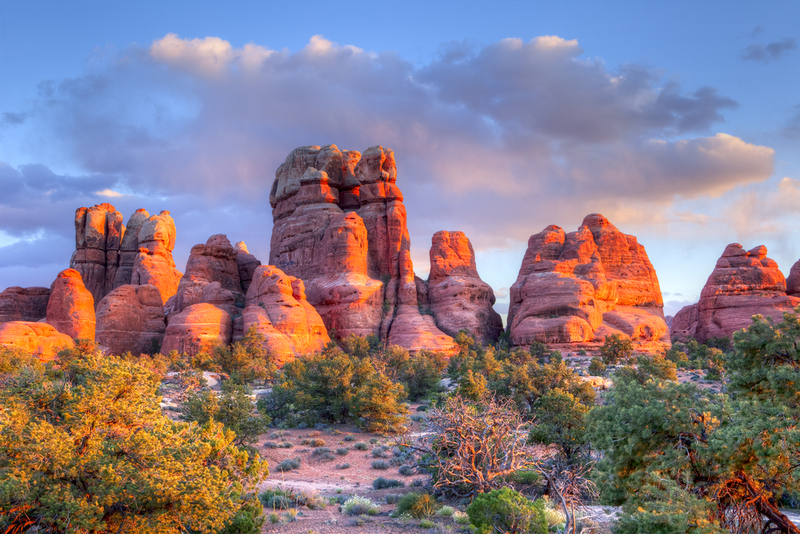 Below, find a few of our favorite Canyonlands trails in both the Island in the Sky and Needles districts. For complete details on hiking opportunities in Canyonlands, including information about backpacking and backcountry camping, click here. Terrain: An easy stroll along the canyon rim to the end of the Island in the Sky mesa. Some of the best panoramas in the park. Terrain: If you want to see a stunning sunrise, head to this short trail before dawn. Flat, easy, and leads to a unique sandstone arch situated on a cliff edge. Terrain: Follow this easy-to-moderate trail to a unique and mysterious crater, possible caused by meteorite impact. Terrain: This lengthy and strenuous trek sees about 1,500 feet of elevation change and should not be attempted in the extreme heat of July and August. The trail requires route-finding, climbing, and scrambling through boulder fields -- but if you’re up to the challenge, the views are rewarding. Terrain: An easy-to-moderate trail which doesn’t see much elevation change, but does require hikers to climb two ladders. View a historic cowboy camp and prehistoric petroglyphs. Terrain: A moderate-to-strenuous journey through desert grasslands and deep, narrow fractures. There is no water available on this exposure-heavy trail, so bring more than you think you’ll need. Terrain: This strenuous trail involves ladder-climbing and rock-scrambling, but rewards explorers with some of the most stunning views in the park. The bottom of the canyon is sandy, so be prepared to dump your boots! Thanks to its location between two of Utah’s most commonly-visited national parks, the small town of Moab is a bustling center of culture, cuisine, and activities. If you find yourself in need of a non-park adventure, here’s where to head for the best eats, drinks, and diversions. Whether you’re just in need of a quick snack stop or dying for an excuse to get all dolled up, you’ll find what you’re looking for at the following Moab restaurants. Type: This upscale, date-night dinner joint features a hand-selected wine list paired with elevated fare. Opens nightly at 5 p.m.; reservations are taken (and recommended). Type: For a hearty-but-healthy breakfast or an indulgent, vegan sweet treat, don’t miss this quirky Moab coffee and gift shop. Type: Gotta have a pizza -- or a heaping plate of pasta? This small Italian franchise is a western favorite. Buon appetito! Type: This popular food truck only does one thing, but they do it extremely well. Stop by to check out their rotating list of homemade quesadillas. Don’t forget a side of chips and guac! Type: You may be in the Utah desert, but once you step foot inside this barbecue joint, it’s North Carolina all the way. Open Wednesday through Sunday from 4-9 p.m. for dinner, before moving inside Woody’s Tavern to serve a limited late-night menu. Type: If you want an authentic taste of Utah, head to this down-home watering hole for house-made fry bread, hand-cut steaks, and world-class barbecue. Type: It may just be a small food truck, but this joint packs a powerful punch if you’re in the mood for Mediterranean. Need a gift for mom… or for you? Or maybe all those trails mean it’s time for a new set of hikers? No matter what you’re after, you can find it at one of the following Canyonlands-area vendors. In need of a stargazing guide or the cancellation stamp for your National Parks Passport? The official Canyonlands bookstore carries informative literature, gifts, snacks, and more -- and you can get it all without ever leaving the park. This beloved one-stop gift shop sells all the classics: T-shirts, shot glasses, mugs, and themed picture frames… but since this is southeastern Utah, you’ll also find authentic, handcrafted Native American art and jewelry. You didn’t come all this way to sit on your RV’s couch and stream Netflix. So whether it’s hiking, biking, climbing, hunting, fishing, or something even more adventurous, this locally-owned gear shop has you covered for safe and exciting outdoor fun. Yes, learning can be fun -- and it can also be a great way to spend a rainy day (or wait out that post-hike soreness)! Here are the best museums and cultural attractions in the Canyonlands National Park area. Film history is inseparable from our perception of the “wild wild west.” To learn more about that history and heritage, visit this memorabilia-packed exhibit at the Red Cliffs Ranch -- which is where a lot of those western classics were filmed in the first place. It took a lot of time to form those stunning rock formations you’ve been exploring. Stop by this museum to explore Moab-area history, including paleontological, geological, and archaeological finds. You could easily spend a lifetime exploring Canyonlands alone -- but there’s so much more to see and do in this rugged landscape. Here are just a few suggestions. You don’t have to go to Napa for award-winning wines. Sit back, relax, and taste what that arid Utah clay can grow. Only twenty miles south of Moab, this small mountain range offers a totally different view of Utah: forested hiking trails, snow-capped mountains, and alpine lakes. If you’ve still got a hike or two left in you, take the opportunity to explore the landscape on foot… or if you’re all tucked out, cruise around the popular 63-mile scenic loop road. Way more than just a life-size-dinosaur-filled photo opp, this roadside attraction offers visitors a variety of ways to learn and explore. Don’t miss the prehistoric aquarium or the chance to catch a film at the 3D theater. This part of Utah enjoys some of the darkest, starriest skies in the country, but if you don’t know Scorpio from Sirius, you could be missing out. This locally-owned outfit will give you a stunning introduction to the stars, which look especially epic on a red rock backdrop. 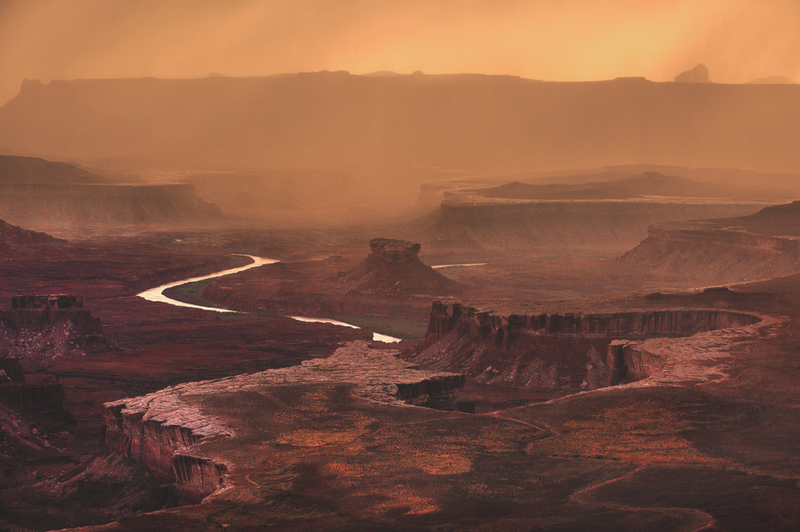 The two main districts of Canyonlands, Island in the Sky and the Needles, must be accessed separately; there are no bridges or roads connecting them within the park. 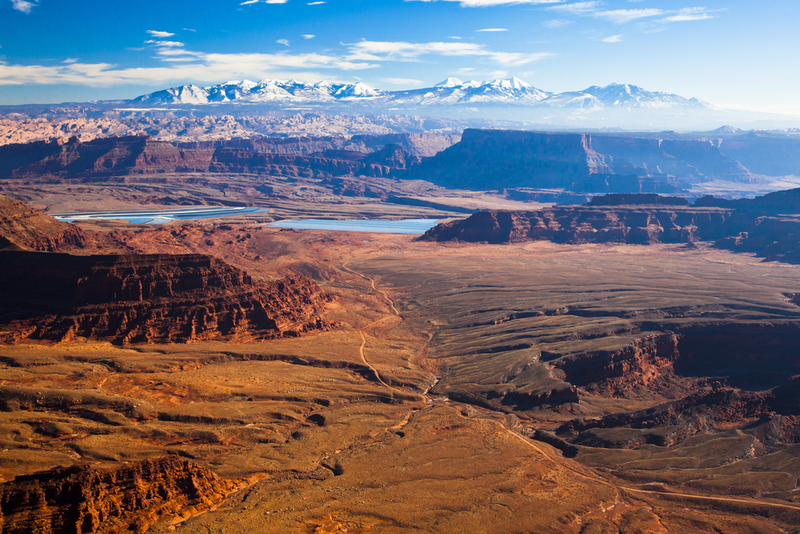 To access Island in the Sky (the northern part of Canyonlands), take US 191 north of Moab to UT 313. To access the Needles (the southern part of Canyonlands), take US 191 south of Moab to UT 211. Do not rely on a GPS, which can be unreliable in these remote desert landscapes. Instead, invest in a map. The closest large airfield to Canyonlands is Salt Lake City, but smaller airports exist in Grand Junction, Colorado (Grand Junction Regional) and just outside Moab itself (Canyonlands Field). Amtrak trains also stop in Grand Junction, Colorado and Green River, Utah, which are both within a two-hour drive of the park. Traveling in an RV is one of the most comfortable and convenient ways to stay, allowing you to camp on-site and move between different park districts at your leisure. If you don’t have a motorhome or travel trailer of your own, check out the RV listings in your area -- or in the Canyonlands vicinity, if you’d rather fly in and rent locally. The National Park Service does charge visitors a fee to enter Canyonlands, but your admission is good for seven days. Plus, you can rest assured that your money is used to improve and maintain park facilities and interpretive services. Private, non-commercial vehicles (15 passenger capacity or less) and all occupants. One or two passengers on a private, non-commercial motorcycle. One individual with no car (bicyclist, hiker, pedestrian). Youth 15 and under are admitted for free. You might also consider purchasing a $55 Southeast Utah Parks Pass, which gains you a year’s access to both Arches and Canyonlands as well as Hovenweep and Natural Bridges National Monuments, or the $80 America the Beautiful Pass, which covers more than 2,000 federal recreation sites nationwide. We’re so excited to learn more about your trip to the dramatic Utah desert! Tag us in your Instagram and Facebook posts or send us those drool-worthy photos and details directly at [email protected]. Who knows? You may just see your story on our blog or social media channels!